Hi guys! This is going to be a quick post because I need to clean my house. My parents are coming tomorrow I cannot stand having a dirty house when anyone comes by (family or not). Tonight I have a brand spankin new polish from Vapid Lacquer to show you. This was released on May 27th, and it's still in stock if you are interested in purchasing it. 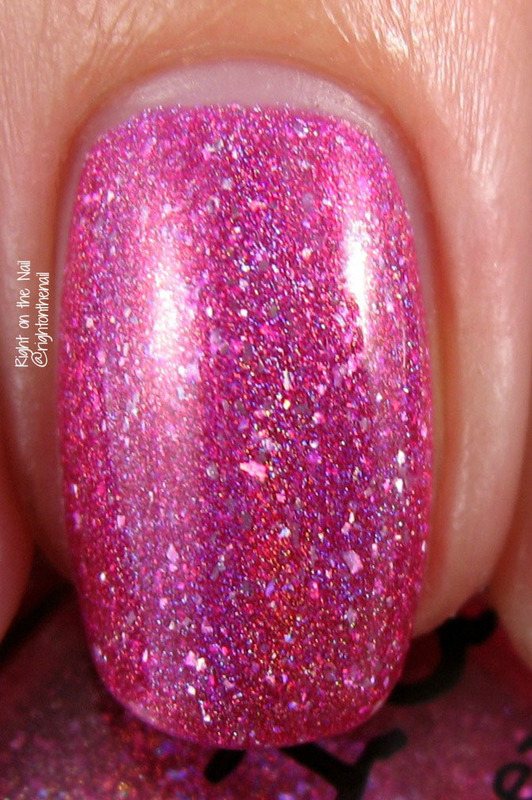 So Vapid has a core color named Original Sin which is a straight berry pink linear holographic polish. I don't own it, but you can find swatches from other bloggers online. Original Sin Dirty Holo differs from the original in that it has a boatload of larger holographic flakes to add some pizzazz. Who knew holo polishes needed even more pizzazz? And isn't the word pizzazz awesome with all those z's? Bedlam Beauty has a direct comparison of the 2 polishes, so stop by her blog to see how they stack up. I happen to prefer the Dirty Holo version, but I've always been fond of "busy" polishes. It basically applied itself in 2 easy coats, and it's not chunky at all. It looks like it would need a thick topcoat, but it lays down well so your normal topcoat will work just fine. You can find Original Sin Dirty Holo on the Vapid Lacquer website for $11. I also bought my first wax tarts from Kris, and they have a strong throw and are long-lasting. They are currently out-of-stock, but they'll be back with more soon. And for just a couple bucks a shot, I find them well worth it.